How do I book my beach vacation? Start with a search on our user-friendly website. Consider how many guests will be traveling with you, their ages, and what you would like to do. 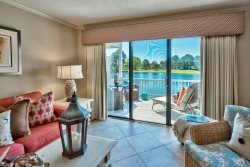 Many of our homes offer unique “out of the box’ vacation experiences in addition to playing on our beautiful Gulf beaches. If you need assistance or have a question about a property you’ve found, give us a call at (888) 318-0022 and one of our team members will be glad to assist you. Many of our rental properties are not pet-friendly, however, there may be a few available upon request. Within your search look for our “Pet-Friendly” note within your searches – or give us a call (888) 318-0022 and a team member would love to help find a home that is just right for you and your pet. Our vacation homes are stocked in such a way that you always feel like you are coming "home" to your "vacation home" rather than returning to a small hotel room. You will be able to enjoy a full-service home while you are on vacation rather than a small, cramped hotel room.